Piper Exhausts Vauxhall Astra MK4 1.4/1.6/1.8/2.0 Hatch (2002-) Rear Exhaust Box. Tailpipes Available - A, B, C, D, E, F, G, I, J, R & S.
Note: this does not fit turbo or coupe models. Note: for models with a sleeve fitment rear box only. Note: the image shown may be for representational purpose only. (A = 3.5 Round Inwardly Rolled) B. 3.5 Round Outwardly Rolled. = 3 Twin Outwardly Rolled. = 2.5 Twin Outwardly Rolled. = 3 Slash Cut Twin Tails. = 4 Round Slash Cut Jap. = 5" x 3" Oval. = 6" x 4" Oval. = 5" x 3" Inwardly Rolled Slash Cut Parallel. = 3.5 Twin Slash Cut Jap Style. = 3 Twin Round Inwardly Rolled. = 2.5 Twin Round Inwardly Rolled. Piper have been producing exhausts for over 20 years and their range covers most. Of the popular cars released over that time. Piper can offer exhausts made from. T304 aircraft quality stainless steel. Or black enameled mild steel. All have been designed with both. Piper Exhausts uses the same flow bench and R&D facilities as Piper Cams when developing new products to ensure. Piper Exhausts are renown for their unparalleled choice of tailpipe style options and the ease of fit of their systems. Make them the choice of both professional fitters and DIY tuning enthusiasts alike. We offer a range of fitting services at our fully kitted workshop which is located 5 minutes from the M65 in Great Harwood, Lancashire. (for Sat Nav accuracy please use the postcode BB6 7UF as the site we are located on is new and may not be listed in your Sat Nav). Found this item cheaper elsewhere? Please get in touch with us and we will try our best to beat the price! 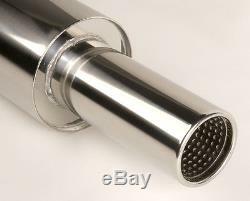 The item "Piper Exhausts Vauxhall Astra MK4 1.4/1.6/1.8/2.0 Hatch (2002-) Rear Exhaust Box" is in sale since Wednesday, November 26, 2014.